Indulge yourself to these extremely luxurious sweets. 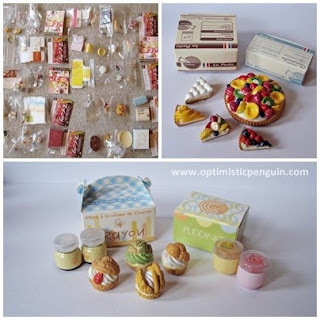 You will be amazed to see all the cakes, cookies, chocolates come in separate pieces! Put these pieces into the specially designed boxes that comes with each set, and make your own sweet selection! The set comes as it would to a store, with a big box which can be made into a display and with each item being in its own little box. Inside each individual box the item is packaged in plastic bags, and most of the paper pieces are flat ready to fold and make into boxes. There are also printed cards with details about the collection and a nice picture of that set. Each piece in this collection is beautifully crafted. The detail on all the pieces is just astounding they look so delicious and edible. With each piece a wonderfully coloured paper craft box is supplied to be folded and formed, and in which you can store each item set. Honestly I cannot express how detailed and intricate each set is. 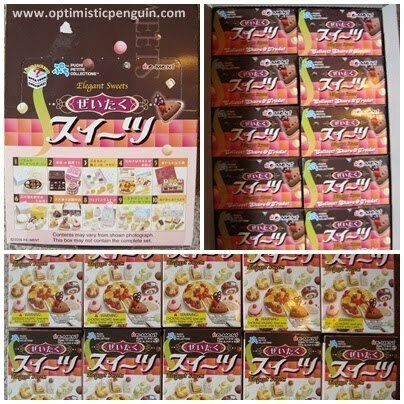 Each item is separate and free from its container, boxes have trays which can come out, and each item set has its own paper craft box to sit in. It is no wonder Re-Ment are such collector’s items as they are just beautiful. The paint work on these items is as detailed as the sculpting, with beautiful colours, shading and fine detail, they really look good enough to eat and make me hungry every time I look at them. So nothing much to say except superb. 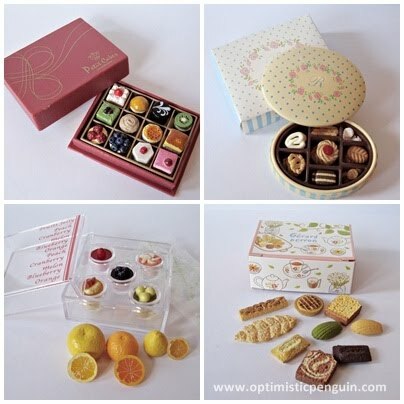 The Elegant Sweets collection is a set of 10 pc's. I will now go through what each pc contains. Set one Socialite's Tea Party comes with a paper craft box and a nice oval biscuit tin with a large selection of biscuits, with four of each biscuit. 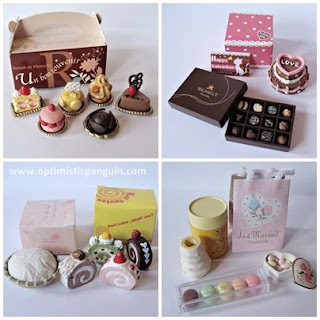 Set two Chocolate Lovers comes with a paper craft box and sign, a lovely chocolate cake and a tray of chocolates. Set three Jiggling Fruit Jellies comes with a lovely clear box four cups with jellies in an orange, lemon, and a grapefruit and sealable bags to place them in. Set four Girls Like Tarts comes with two paper craft boxes, a fruit cheese cake and a selection on four cheese cake slices. 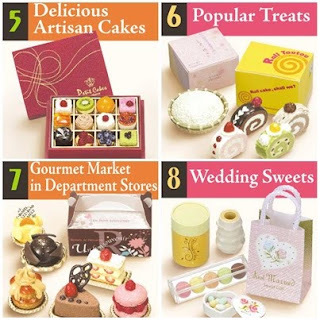 Set five Delicious Artisan Cakes comes with a nice box and gold tray and each cake looks just divine. 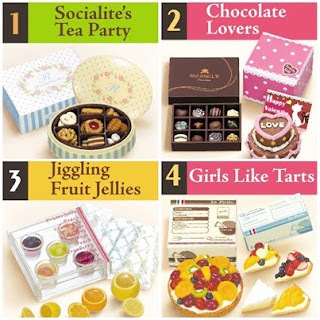 Set six Popular Treats comes with two paper craft boxes four slices of Roll or Log cake, and a specialty dish in a basket. Set seven Gourmet Market in Department Stores comes with a nice paper craft box and each delicious piece comes with a golden dish to sit on. Set eight Wedding Sweets comes with a nice carry bag, a heart shaped box of chocolate eggs, a box of biscuits, a cone of candy floss and a jar for storing the candy floss. Set nine Cream Puffs and Rich Pudding comes with two paper craft boxes four cream puffs, two jars of pudding and two pots of honey. Set ten Local Specialty comes with a paper craft box and a selection of breads. So overall a large selection of sweets and treats to choose from. 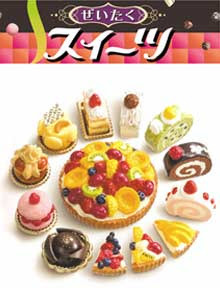 The Elegant Sweets Collection is 1/6 scale and so it a bit too large for Figma's and Nendoroid's, however as it is food one can just pretend that they are extra large portions, and so even though it is not precisely in Figma scale it still is convincing enough to use for display purposes. The Elegant Sweets Collection like other Re-Ment items are in the same scale as the MegaHouse Mini Collection and so they fit nicely into my MegaHouse Mini Collection Display Case. 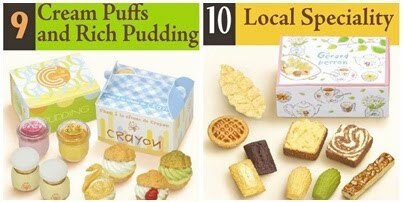 The Elegant Sweets Collection is fantastic, there are so many choices of delicious food for my figures to snack on and so many possibilities for photo shoots and comics. My figures can now dine in the lap of luxury.